The Nazis under Hitler developed a number of crazy weapons. Some, like the V-1 and V-2 missiles were harbingers of the future. Others, like the enormous battleships Bismarck and Tirpitz, were the zenith of a soon obsolete weapons systems. A few like the Ratte, a tank the size of a small office building, turned out to be just impossible fantasies. One that was actually built, however, almost defies belief. It's the Schwerer Gustav gun.The biggest cannon ever used in combat. In the 1930's as Hitler eyed up an eventual invasion of France, he saw a problem. The French had constructed a massive set of defensive forts along their border with Germany. Called "The Maginot Line" after the French Minister of War Andr� Maginot, it was a series of concrete fortifications, obstacles and weapon installations stretching along the frontier with Switzerland, Germany and Luxembourg. These fortifications were impervious to anything the German's had at the time. Hitler went to munitions maker Krupp asking them to resolve this problem. Whatever the solution was would require a weapon that was able to punch through 7 meters (23 feet) of reinforced concrete or 1 meter (39 inches) of steel armor plate. 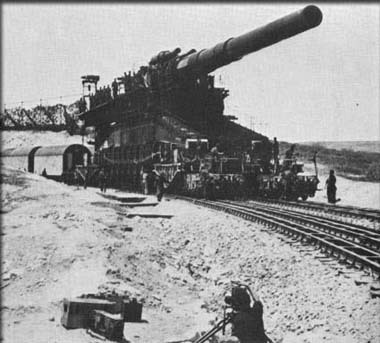 Krupp's answer was an enormous railway gun. To have the kind of power needed, the cannon would have to be gigantic. With a barrel with an inside diameter of 31 � inches (80 cm) and a length of 107 feet (32.5 m) it was far larger than even those found on the battleships of the day. A single shell for this gun alone would weigh 7 tons and the gun itself over 1300 tons. The high explosive version of the shell would create a create a crater in the ground 30 feet (9.1m) wide and 30 feet deep. With the ability to fire a round almost 30 miles (48km) it could keep safely out of range of any retaliating artillery. Plans were completed for the weapon in early 1937 and fabrication started in the middle of the year. 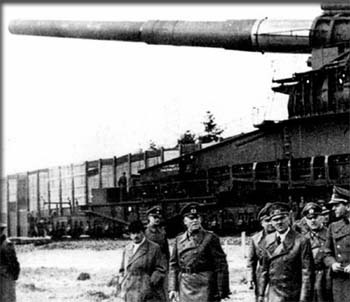 Like other large guns of that era, it was planned that Schwerer Gustav (Gustav after the name of the senior director of Krupp and Schwerer, which meant "heavy" for obvious reasons) was to be a railway gun. 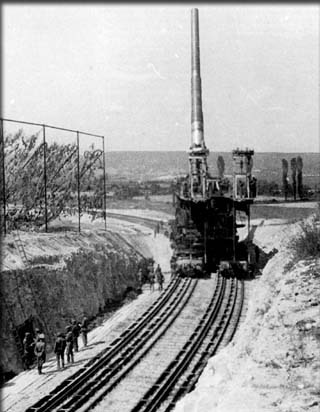 Using the railroad was an obvious way to transport very heavy weapons systems in that era, though it limited the device to only places where a railroad line existed or could be built. Hitler inspects the big gun during testing. 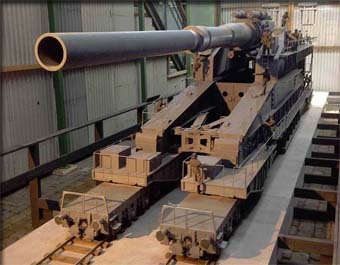 While most railway guns of that era could be operational after just a few hours, Schwerer Gustav was so large that it needed not just one track, but two parallel tracks laid side-by-side at a specific distance. This meant before the gun could be used it had to be transported to the location pulled by a regular 25 car train, then assembled and placed onto a set of specially prepared parallel tracks. The assembly operation, not includingly the time to lay the special track, could take three days and involved laying another set of parallel tracks on either side of the two for Gustav to support a pair of cranes. It took 250 people to run the gun and over another 1000 to support it. Schwerer Gustav was ready for combat by 1941, but by then the original reason for its construction no-longer existed. Germany invaded France in 1940 by simply going around the the Maginot Line to the north rendering the complicated set of defenses useless. It was until early 1942 that Gustav found a target. In June of 1941 the Germans launched Operation Barbarossa, the invasion of the Soviet Union. By February of the next year the Germans were laying siege to the city of Sevastopol in the Crimea and decided to bring the big gun to their eastern front. The Soviet naval base at Sevastopol was one of the strongest fortifications in the world at the time. It was located on a high cliffs overlooking Severnaya Bay and the natural lay of the land made approach from any direction difficult. To further strengthen the defense, the Soviet had built a series of reinforced concrete forts around it and mounted old battleship guns in them. Gustav rolls out of its protective trench to fire during the seige of Sevastopol. The Soviet forces at Sevastopol were proving to be a major headache for the Germans. Air raids launched from there and the rest of Crimea were taking a toll on the German controlled oil fields in Romania vital to the German war effort, so Hitler ordered that the area be seized and put under German control. To get Gustav close enough to be of use the German's laid a 10 mile spur line from the main railroad to where they planned to place the gun. At that location they constructed a set of curved double tracks on which the gun could be assembled. Schwerer Gustav, like many large railway guns, could only be raised and lowered in elevation, but not turned (or traversed) to the left or the right. To aim these type of railway guns it was necessary to find or build a curved section of track. The barrel could then be aimed by moving the gun back and forth along the curve until it was pointed at the target. On the 5th of June, 1942, the gun first spoke in anger. Eight shells were fired at a set of costal guns and another six at Fort Stalin. The next day seven more shells were fired at Fort Molotov, then Gustav took on one of its most difficult targets, an undersea ammunition magazine located beneath the bay. Despite the magazine being almost 100 feet (30m) under the sea floor and protected by 30 feet (10m) of concrete, Gustave fired 9 shells into it destorying it utterly (and also sinking a ship that just happened to get in the way). Over the next few weeks the heavy gun would fire 17 addition shells during the siege. On July 4th the remaining Soviet forces surrendered and the Germans took control of the city and what was left of the military installations. Schwerer Gustav had fired 48 rounds during the battle. This, along with shots fired during testing, was enough to wear out its barrel, so this was removed and replaced with a spare. The original was shipped back to Krupp to be relined. With its new barrel, Gustav was disassembled and moved to Leningrad where the German's anticipated using it in an attack of on the city. The attack was cancelled, however, and the heavy gun was never used again. In April of 1945 the Germans decided to destroy the cannon to avoid it being captured by Allied troops. The Russians took an interest in the remains and had it shipped to to Merseburg for study. As impressive as big guns were, they were totally impractical given the difficulty of moving and emplacing them. Given their great size they were also easily seen from the air and therefore subject to attack from aircraft. Their bulk also meant that they could not be hidden easily in a convenient tunnel like smaller railway guns (See our article on Anzio Annie). As aircraft became more powerful and capable of carrying heavier and heavier bombs, the job Gustav was designed for, piercing strong bunkers, was left more and more to them. Airplanes had obvious superior mobility and cheaper cost and could do the job just as well. By the end of the war the British bombers were regulary using the 12,000 pound Tallboy "earthqucke" bomb which was just as effective against hard targets as the shells from Schwerer Gustav.